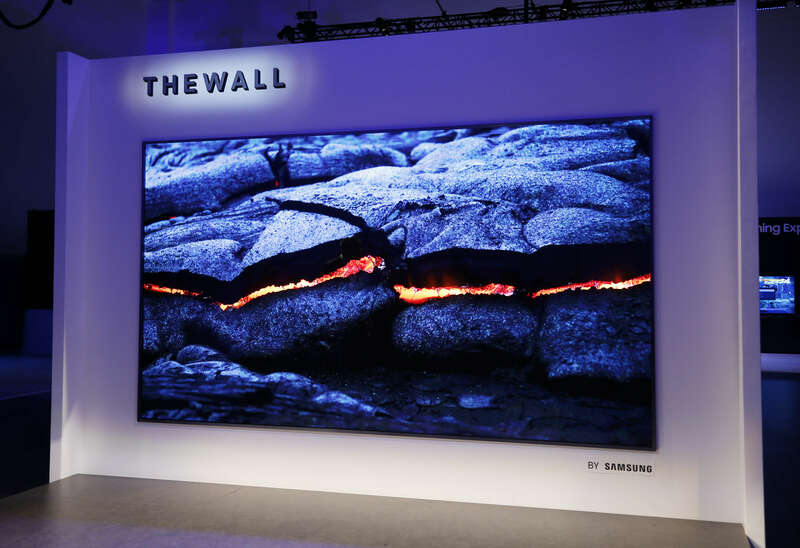 Samsung presents 146-inch modular MicroLED TV aptly called "The Wall"
We learned last year that Samsung had plans to showcase MicroLED technology at CES. Now that the show is upon us, Samsung is following through with their intentions of massive LED TVs. The Wall is a 146-inch modular TV built using extremely tiny LEDs. There is no need for color filters or backlighting thus there is no light bleed. Being a modular TV, each segment is completely bezel-free and allows for the display to be resized as needed. No pricing has been announced for The Wall but there is no question that it is going to be beyond the reach of most consumers. A more traditional 4K TV is still the best available without breaking the bank. Moving beyond 4K, Samsung has also featured the first QLED TV with 8K AI technology. South Korea and the US will be able to purchase a QLED TV with upscaling to 8K in the second half of 2018. With the lack of raw 8K content available, upscaling is the next best solution but still not quite as good as native footage. Cord cutting remains popular but Samsung is sure that some users still watch regular TV on their displays. To help find what to watch, Universal Guide will act as a program guide and offer recommended TV shows based on viewing habits. Not to be forgotten, Samsung's voice assistant Bixby is finding its way to TVs. Integrating with the SmartThings IoT hub and making navigation of menus easier, Bixby stands behind all voice recognition for Samsung.